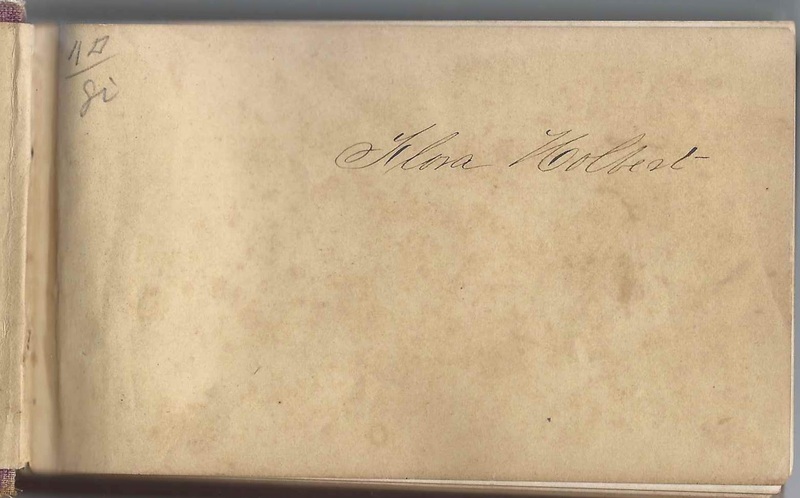 1870s autograph album of Flora Maria Holbert of Homer, Minnesota. Many of the signers were attending Normal School at Winona, Minnesota, as I imagine Flora herself was. The Normal School is now known as Winona State University. 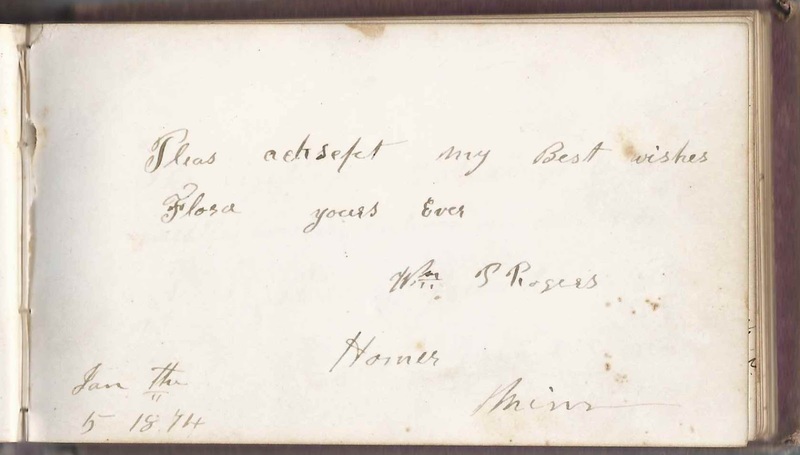 The album is approximately 5-3/4" x 3-1/4" and contains the sentiments of over 50 of Flora's relatives, friends and classmates. An alphabetical list of the senders appears at the end of this post. Flora Maria Holbert was born 31 December 1857 at Homer, Minnesota, the daughter of George Edward Holbert and Mary Jane (Rogers) Holbert, who were born in Pennsylvania and New York, respectively. No other Holberts signed in the album, but three of Flora's maternal uncles, brothers to her mother Mary Jane (Rogers) Holbert, signed. William P. Rogers of Homer, Minnesota, signed on May 18, 1874. He was the older brother of Flora's mother Mary Jane (Rogers) Holbert. 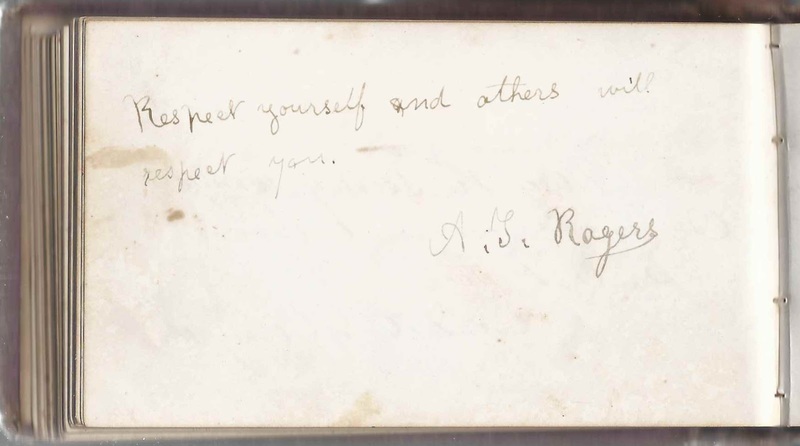 An A. T. Rogers signed twice in the album; I believe he was Albert T. Rogers, younger brother of Flora's mother Mary Jane (Rogers) Holbert. 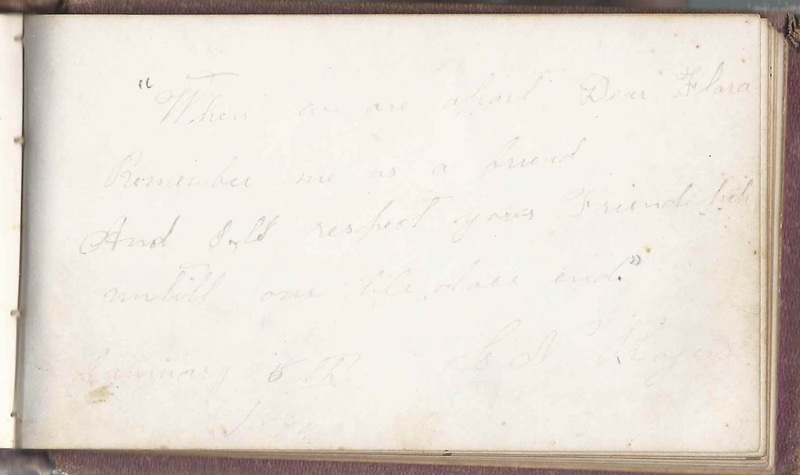 Another page, faint and hard to read, was signed by G. N. Rogers, who was presumably George Nelson Rogers, the youngest brother of Mary Jane (Rogers) Holbert. About 1874, Flora Maria Holbert married Reuben C. Norton, son of Howell Buell Norton and Margaret (Cross) Norton. Reuben, a carpenter, was born 15 February 1838 in Michigan. 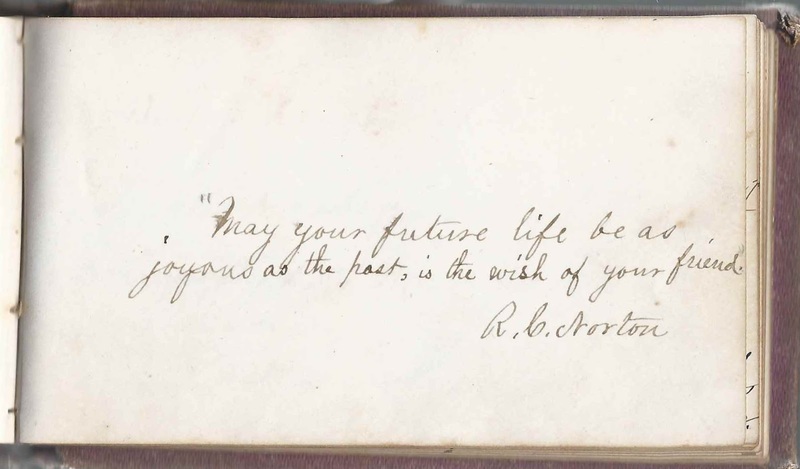 He is presumably the R. C. Norton who signed two pages in Flora's album. Flora and Reuben lived at Rockford, Illinois, and raised, I think, three children. Flora died at Rockford, Illinois, in 1938. Reuben had predeceased her in 1920. Joe. "Within the Mississippi Valley on Minnesota's fertile soil, Was where we learned to love each other, And for each others lives to toil. And we will not forget our love But will hope to meet above." Mattie F. Garland of Rochester, Minnesota; G.A.W.J. R.E.N. Clara B. Howe of Rochester, Minnesota, signed on July 7, 1874; R.P.S. F.S.N.S.W. 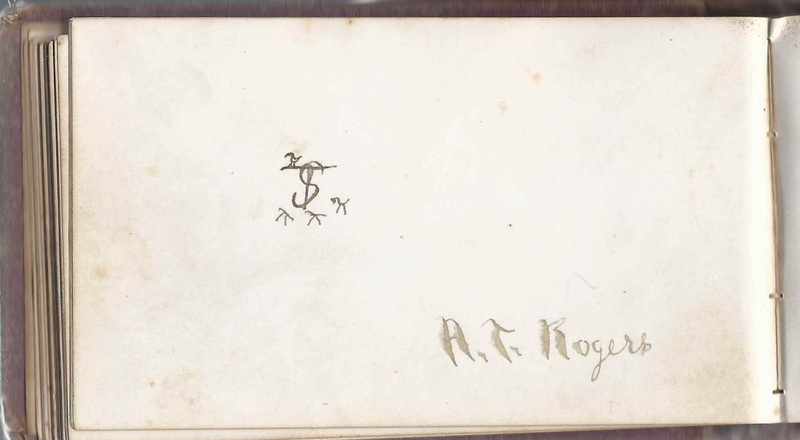 A reader has deciphered a signer as possibly Rouard Irsinger or Ursinger. This signer inscribed the page at Winona, Minnesota, in April 1874. "Men apt to promise are apt to forget". Das schreib die hinters Ohr. Winona, den 30sten April 1874"
Timie Ledstrand, signed at Winona, Minnesota, on January 27, 1874; F.S.N.S. Miss France Sharpe of Winona, Minnesota; not sure of her given name. Ella Tucker, signed at Winona, Minnesota, on June 26, 1874; F.S.N.S. 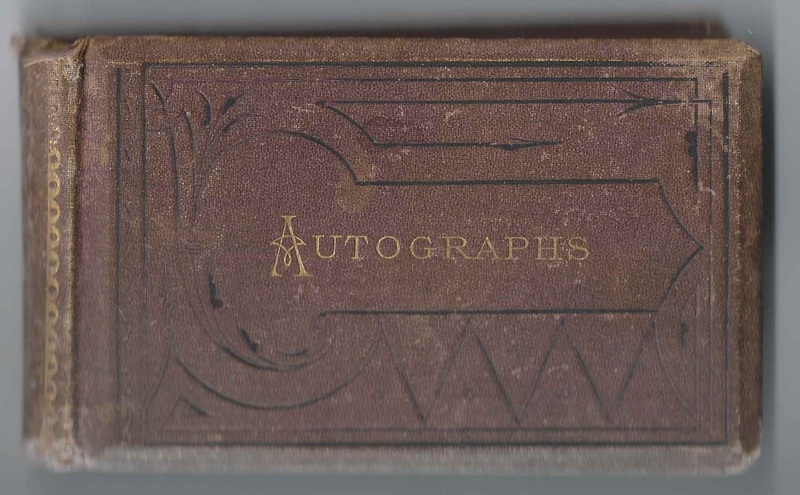 A reader has deciphered a signer as possibly Rouard Ursinger or Irsinger. 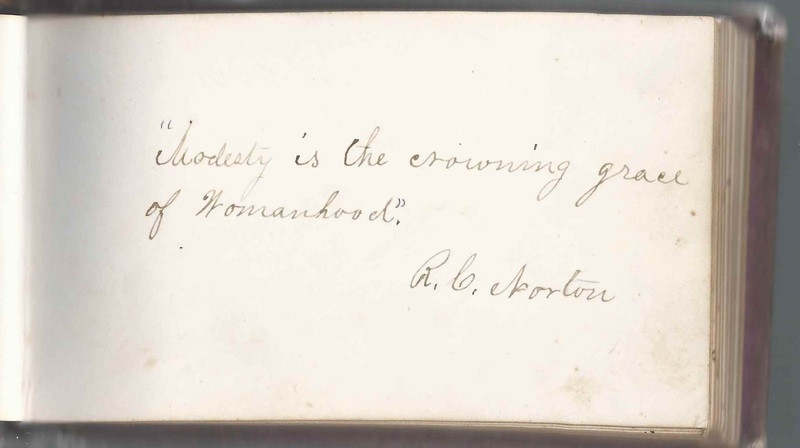 This signer inscribed the page at Winona, Minnesota, in April 1874. "Men apt to promise are apt to forget". Das schreib die hinters Ohr. Winona, den 30sten April 1874"